Of all the problems we hear about at Consumer Watchdog, one of the commonest is with used cars. We all know that buying a second-hand car can be a nightmare. The main problem is knowledge. Most of us don’t know more than the basics about how a car works so we can easily find ourselves taking the wrong decision on impulse or find ourselves being deliberately deceived. One of the main deceits you’ll encounter is about specially imported cars and that they can be a good idea. I don’t think they can. I’m not necessarily talking about cars that have already been imported, I mean the import web sites you visit that show you a car that’s currently in a far-flung land at a knock-down price. You can see adverts for them in the newspapers, on Facebook and even emails that just turn up in your Inbox advertising the services of the companies that ship the vehicles. The main problem must be the simplest. When you buy a car, particularly a second-hand one, you always take it for a test drive. You always get a chance to see if it works properly, if it’s comfortable, if it just feels like the right car for you. You also get a chance to inspect it’s condition. Is there oil leaking from it, does the gearbox seem ok, are there any weird noises coming from the engine? None of this is possible when you buy a car online. You really do get no more than a picture on a web site. Can you trust that? The answer is, of course, that you can’t. A few months ago a reader asked us for advice on cars he’d found on a Japanese web site. All were 12-15 year old Toyotas, all models that you and I have never heard of and all were incredibly cheap. One was available for $600, the other two for $950 each. The total bill for buying them and shipping them all from Japan came to $4,950, about P40,000. The details they’d sent him were extremely specific, even giving the chassis numbers of the vehicles they were selling. That just stimulated the detective in me. Within minutes I found the very same vehicle with the same chassis number also on sale in Georgia, 8,000km away from Japan. How can the same car be available from two different places? Even if you do buy a car online, even if it does turn out to be mechanically sound, is it even worth it? The one advantage importing a car from overseas appears to have is price. They seem to be incredibly cheap. But are they really? Rather than try and work this out for myself I consulted an industry expert. I won’t name him but rest assured that if anyone knows about these things, he does. He got in touch with one of these companies in the UK and this is what he told me. “I requested a price for a 2004 VW Touareg and they came back with a basic price of £8,400. On top of that was £850 for shipping, £400 port costs, £350 delivery to Gabs, £1,400 for duty and tax, a total of £11,400. That’s about P137,370 or R145,612. The trade price for the same vehicle in pristine condition from SA would be R154,800. Chances are it would be some R15-20,000 less. So expect a trade price of R134,000 or P124,200. If you buy from the UK company you’ll actually pay more for something you haven’t seen and with no guarantee whatsoever. The bottom line is that it is NOT that cheap and, to me, based on this pricing not worth the risk. In addition, once landed, the owner is going to have problems getting spare parts. They are NOT the same in every region and there are many subtle differences that we are unaware of. UK weather is very different to ours, which can mean some changes to deal with cooling issues. Radiators may well be smaller and control modules may also have different settings. European cars also often have very different specification to cars built for Africa. One common difference is the lack of rear electric windows that can alter the internal wiring of the car. This is the same issue with Asian imports. This has caused many problems in the past as these parts are sometimes special orders and non-returnable, so if the local dealership gets the wrong part, it became the dealers problem. That’s why many local dealers will refuse to service imported vehicles. So let’s make this clear. Buying a car online is remarkably risky. You don’t get to test drive it, you don’t get to inspect it, it comes with no guarantee, it might be impossible to service it, you have to pay the entire cost up front and it’s not even a cheap way to buy a car. Why on earth would you consider doing such a thing? Isn’t it making an already difficult situation even more difficult? If you’re confident about the risk then good luck to you, but please, before you take that risk, do some research. Check the prices available from local dealers or their cousins in SA and then do the maths. You might just find that the safer option is also the cheaper one. I would like to find out what happens in a case where I signed a 2 year rental lease and there is no provision for the length of notice of termination in the lease. The landlord tells me unless and until he finds a suitable tenant I will be liable for rental. What happens if I want to move out? Please advice. Please help. Unfortunately from what I understand about your situation you don’t have many options. You are committed to the lease. Unless there is a termination clause in the contract that discusses early termination the duration of the lease will apply and if the landlord isn’t willing to negotiate then I can’t think of much that you can do. The landlord is probably within his rights to demand either that you continue paying the rent or that you find a new tenant for him who will either finish your lease or will sign a new one. Unfortunately you did, after all, sign a 2-year contract and you’re committed to it. Sorry I can't give you better news! In 2010, I bought a Toyota Hilux but the rear mud guard flap together with the spare key were missing. The garage promised to sort out the problems and advised that they would call me so that the same could be sorted out. After a long time of promises and calls to them, I decided to confront them personally and the owner kept on promising that the matter would be sorted out. After making a lot of noise for a year, they assigned a mechanic who is no longer in their employment to help me but he failed to code the key and promised that he would contact specialists for a special appointment which to date has never materialized. In May this year, I again confronted the garage who referred me to a Supervisor who also promised to sort out the problem at the earliest but to date nothing has been done. I think the garage has really abused my consumer rights and believe the contract of sale has been abrogated by the garage and am I’m asking for advice about whether if I could sue the garage or what? It certainly sounds like you HAVE been treated badly. I’m no expert but how difficult is it to program a key? OK, let me be a bit more understanding. A car key probably IS a difficult thing to program. It’s meant to be that way. We don’t want just anyone programming a car key, it’s meant to be something only a specialist can do. Nevertheless I share your confusion. I think it’s time to write to them and demand some action. I suggest that you give them seven days to supply you either with a programmed key or a partial refund. You obviously can’t demand back the entire value of the vehicle but you CAN demand some something back from them. Suggest to them that if you don’t get a swift solution you’ll take them to the Small Claims Court and ask them to intervene. Let me know how they react! I’ve commented on various Ponzi schemes like Eurex Trade in the last few months. Just a few days ago a enormous Ponzi scheme called ZeekRewards collapsed, leaving perhaps 1 million people out of pocket. Yes, a million victims. And perhaps $600 million in investors money. "came as many began to question the legality of the operation and whether its promised 1.5% daily returns were simply ‘too good to be true.'" Just like all collapsed Ponzi scheme they have one thing in common: promises of financial returns that are just unbelievable. No legitimate investment scheme can offer investors 1.5% per day. Just like Eurex Trade can't really offer the daily return of 2.9% that they claim. It's impossible. Ponzi schemes all collapse sooner or later. All of them. The health of our families, friends, colleagues and neighbours is under threat. Not from disease and illness but, ironically, from people claiming to be able to cure us of disease and illness. You will have seen the advertisements in certain local newspapers (but I feel obliged to point out never Mmegi) advertising a vast array of pseudo-medical products and services. While some are clearly ridiculous, in particular those offering “enlargement” and “tightening”, many others are far more dangerous, offering treatments and cures for fertility problems, pregnancy problems and in one I saw, “complicated diseases”. I have even seen advertisements where the “healer” claims to be able to cure diseases that are “otherwise incurable”. Others specifically offered treatments for diabetes, epilepsy and cancer. Of course, those that are most concerning are those that hint at treatments and cures for “immune” problems. It’s quite clear who these adverts are aimed at. Later they offered to email me more details about these medicines. Using the email address “herbalmedicine999@gmail.com” they told me that these “Babao Relife Capsules” come in bottles of 100 and that 4 bottles would last a month. Each bottle costs P560, a monthly total of P2,240, an annual cost of almost P27,000. These claims clearly breach a variety of the Consumer Protection Regulations but that’s unimportant compared to the other offences they are committing. This is all illegal. It breaches Sections 396-399 of the Penal Code which forbid “prohibited advertisements” for any medicine or treatment for conditions including “venereal diseases”, cancer, diabetes, TB and a host of others. Also I suspect that by offering what clearly are medical services without, I presume, registration they are breaching the Botswana Health Professions Act. Fundamentally, these “Babao Relife Capsules” are a fraud. There is precisely no evidence that they have any effect, other than making desperate people poor and disappointed. They also undermine the serious progress that our nation has made in prolonging life and protecting people from HIV infection. They pose a danger to our national health. Action to protect our family, friends, colleagues and neighbours is required. It’s not just amongst the traditional healer community that charlatans can be found. We also need protection from the other quacks that are out there, the more mainstream ones. The list of professions covered by the Health Professionals Council includes Clinical Psychologists and Dieticians but what about the array of people calling themselves “nutritionists”, “therapists” and “alternative practitioners”. None of these semi-professional terms are included in the Botswana Health Professions Act. Any of us can set ourselves up as professionals in these “fields”, deliver services and take people’s money away from them. Nobody would regulate us. The same goes for the charlatans promoting a variety of so-called “alternative” therapies, including reflexology, homeopathy, acupuncture, energy “therapies” like Reiki and the bizarre machines with strange names like SCIO and QXCI. All of these bogus techniques claim to have miraculous effects but there is a simple fact that cannot be overlooked. Not one of them works. None of them are scientifically plausible, they’re logically laughable and not one of them is backed up by any evidence whatsoever, not one of them. Nevertheless they abound, most of them coming across the border from South Africa to take money from us under false pretenses. Some people, usually the “practitioners” themselves will hide behind the defense that they do no harm. I disagree. I think they do harm us. Despite many challenges, mostly our geography, we have achieved remarkable things. Given our size and population distribution our healthcare system is remarkable. I’m not suggesting that it’s perfect but what has been achieved is impressive. These purveyors of nonsense threaten our achievements. If they distract just one person with AIDS from taking their ARVs, one person with a heart condition from taking their proven medication or one depressed person from seeking professional psychological assistance then these charlatans have blood on their hands. Unfortunately there aren’t many of us who don’t know someone who tragically died because of their involvement in these bogus treatments. I know of two people who died as a direct result of consulting Bus Rank healers. I know of one person who tried to treat her cancer with alternative therapies, luckily realised in time that she needed real medical help and survived, but only just. I know of people who throw vast amounts of money in the direction of energy medicine healers with useless boxes of technology they claim will balance the victims, sorry, patient’s energy levels. One day they might choose that instead of seeing a real doctor. Minister, I believe the time has come to put aside courtesy and restraint and become much more aggressive. We need you to step in and exercise the powers you have been given to stop this abuse and to protect our people. Before it’s too late. I bought a vehicle in March 2010 from a car dealership in Mogoditshane. The licensing and registration of the vehicle was done by the owner of the dealership. This year my husband went to the post office to renew the license but was told that the vehicle has been suspended because of a customs problem. He went to the BURS office and was told by the investigating officer that he needs to see proof that the vehicle was cleared and paid for, otherwise by law he has to impound the vehicle. He said that if we are unable to provide proof, we must write a letter agreeing to pay the customs duty and VAT. BURS will have the vehicle valued and that we should pay 32% customs duty plus 12% VAT. We spoke to the owner of the dealership and he has been very uncooperative saying that he does not have any paperwork as he didn’t clear the vehicle, it was done by a company in Gaborone who should have the receipts. He has also said that this has nothing to do with him because if the customs duty was not paid, how was he able to register and license the vehicle? And people wonder why second-hand car dealers have a bad reputation? Unfortunately this isn’t the first time we’ve heard of this situation. A car dealer imports a car from some distant country, neglects somehow to pay the duties that BURS applies, sells it to an innocent purchaser and some while later when the car is either sold again or even just re-registered the unpaid tax comes back and slaps the new owner in the face. There is a valid question to be asked. How did the importer manage to register the vehicle when there was duty outstanding? But that doesn’t actually matter. What matters is that the dealer sold you something that he shouldn’t have sold. I don’t believe that he didn’t know that the duty hadn’t been paid. If he was a regular importer he would have known about these things. I think you can argue that he sold you the vehicle under false pretenses. He should either have explained to you that there was an amount of money still outstanding or he should have just paid it himself. Given that the dealer doesn’t want to cooperate I suggest that first of all you make a formal complaint to BURS about him. Perhaps suggest that he deliberately sold you this car while knowing that duty and VAT hadn’t been paid. Suggest that he should be investigated for tax evasion. My experience of BURS is that they’re reasonable people. So long as they understand that you’re being open and honest with them then they’re going to be reasonable with you. You should also write to the dealer who sold you the vehicle and demand that he either settle the debt directly with BURS or give you the money so you can pay them. Let him know that you’re reported this to BURS and to us. Give him seven days to comply or you’ll take whatever action you consider necessary. Let me know how he reacts! I want to settle a debt that I have with a cash loan company. I took a loan of P970 from them in 2010 which I was supposed to pay with 30% interest over two months. They took my ATM card and withdrew P900 from the account the first time. I stopped work for sometime and unfortunately I never went to them to explain to them that I was not working at the time which I admit is very wrong on my part. I just recently acquired a good job and I am trying to get rid of my debts. The lender is now saying I owe them over P2,700. I was just wondering if they are not only allowed to charge me maximum of P1,940. I am thinking of going to NBFIRA to get clarity on the matter, should I do so? Firstly let me congratulate you on doing your best to pay your debts. Your honesty is praiseworthy. The "in duplum" rule applies here. At the time of the settlement of a debt, the interest charged may not exceed the capital amount outstanding. A lender is probably entitled to add an amount for administration but that should be a reasonable amount. The problem with many micro-lenders is that they are very unclear about the repayment mechanism. The P900 they took from you, do they consider that interest or capital, for instance? I suggest that you give them a letter stating that you are perfectly prepared to repay them but only once you’ve received a comprehensive statement of your debt. It must show the money they lent you, the repayments you made and the interest they applied. I also suggest that you let them know you've alerted us and that you will also be informing NBFIRA of the situation. Let me know how this goes?? P.S. The reader told us the name of the cash loan company and guess what? 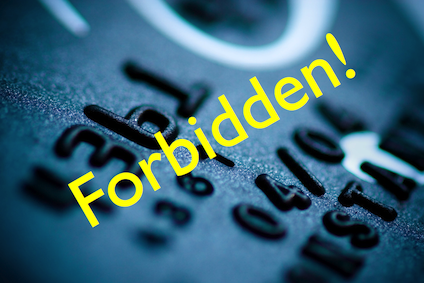 When we called them asking for a loan they said they would take our ATM card from us during the term of the loan. Despite this having been outlawed by NBFIRA? We’ll be telling NBFIRA about this! Another Ponzi scheme fails. Like they all do. Yet another Ponzi scheme collapses. 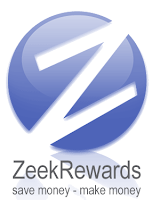 This time it's ZeekRewards that's gone under, leaving perhaps 1 million people out of pocket. "The obligations to investors drastically exceed the company's cash on hand, which is why we need to step in quickly, salvage whatever funds remain and ensure an orderly and fair payout to investors," said Stephen Cohen, an associate director of the SEC's enforcement division. "ZeekRewards misused the power of the Internet and lured investors by making them believe they were getting an opportunity to cash in on the next big thing. In reality, their cash was just going to the earlier investor." Just like all the other schemes that collapse they have one thing in common: promises of financial returns that are just unbelievable. No legitimate investment scheme can offer investors 1.5% per day. Just like Eurex Trade can't really offer 2.9% daily. It's impossible. They're Ponzi schemes and sooner or later they'll collapsee. They always do. Call me old-fashioned but technology is NOT the answer to any problem. Not a single one. Don’t misunderstand me, I’m certainly no Luddite. The Luddites were a group of 19th Century British textile workers who destroyed the mechanised looms that they felt was putting textile workers out of a job. Instead of moving with the times they destroyed the technology that was affecting their livelihoods. When they started murdering people their popularity began to wane. We can’t deny that industry has had an impact on our environment but is this fool really suggesting that longer lifespans, greater prosperity and better health are bad things? He would rather we returned to a world characterised by excrement, illness and dead children. I’m entitled to call this particular neo-Luddite both deranged and a fool because he is Theodore Kaczynski, otherwise known as the Unabomber, a terrorist who killed three people and injured many more in an effort to prevent the greater use of technology. So I’m not any sort of Luddite. In fact I’m a sucker for technology. I’m writing this on my beloved MacBook and sitting nearby are my iPad, iPhone and iPod and that’s just MY home technology, it ignores the rest of the family. My point is that none of these things in themselves solve a problem. They make it easier for me to write, research and entertain myself but there’s nothing I now do that couldn’t be done before, I’m just achieving things in a faster way. The problem is that many people, and worse still, organisations, seem to think that technology IS the answer to their problems. There’s also a ridiculous competitive element to technology. He’s got an iPad so I must have one. She’s got a newer Blackberry than mine so I have to spend a fortune upgrading mine. My competitor just spent millions on a new ERP system so I need to do the same. Instead we need to be a bit more rational. Do I actually NEED an iPad? A better phone? Should I invest millions in a top-of-the-range computer system for my company when I can’t even get the basics right? Let’s take a purely hypothetical example. Let’s imagine a parastatal that delivered electricity to the people of a beautiful land-locked African country. Let’s imagine that they’d spent a fortune on a billing system but bizarrely couldn’t get around to reading the meters that would give the billing system the numbers it needed to calculate bills correctly. Let’s also imagine that the author of a consumer column in a local newspaper in this hypothetical country received a bill for P35,000 for just one months’ electricity consumption, an amount that miraculously dropped by nearly 90% when questioned. Imagine an ex-colleague of his, a single woman, who was suddenly faced with a bill for P23,000 for a month which also dropped to less than a thousand when she complained. The problem here wouldn’t be the technology, it would just be calculating bills according to the rules it had been given. The problem would be the organisation itself that couldn’t collect the necessary data correctly. It would be the organisation that hadn’t reviewed whether the expensive computer system had been taught to do arithmetic correctly. It would be the fault of the people in charge. Take the case of “e-Government”, or e-anything-else for that matter. You can’t “e-“ something unless that thing works already. If a Government process is hideously inefficient to begin with, putting a web page on the front of it will fix nothing. It will just be a hideously inefficient e-process. I heard recently of a large private company here in Botswana, one whose name you’ll know, who’ve decided to adopt one of the latest technologies available, so-called “cloud-computing”. This is simply making computing services available over a network, in particular over the internet. Your company’s computer system are no longer stored on a server in your office but “out there” somewhere, hosted by a cloud computing provider. In theory it doesn’t matter any longer where the servers are, they could be next door, in the next town or on the far side of the planet. So long as you can connect to the network, the service is available. Have you seen the flaw yet? The flaw that affects us in Botswana the most? Imagine what happens when your critical business systems and all their data are stored in the cloud and the power cuts. You might have a generator of course but are you confident that the interruption won’t break something? What effect would a loss of connection have if it happened during your monthly payroll run, while opening a new account or while printing statements? It needn’t even be your power cut that breaks things, it might just be your internet service provider that suffers the cut. Any break in connection might have a tremendous impact. The company I heard of is just starting this process, it’s only their email systems that are going out into the cloud but sooner or later they’ll get more ambitious and it’ll all fall apart. Instead why don’t they invest the money instead in hiring better management who can focus on the things that really matter? The things that might improve the service they offer you and me? Update: I spoke to the company in question earlier today about a billing issue. I asked them to email me copies of some invoices and guess what? They can't. Their email "is still down". I have a friend who invested her money with an offshore company in Panama called Eurex Trade and sent them money amounting to P28,000 earning 5 percent interest daily. The money was sent through Western Union. So can you please help look into the matter? I’ve commented on EurexTrade several times before. I firmly believe that this is a Ponzi scheme. The clues are there if you look for them and if you look past the astonishing claims they make. Firstly they claim on their web site that you can earn “Up to 2.9% Daily”. Clearly your friend has been promised an even greater return. This is simply impossible. There is no investment scheme that actually makes that sort of profit. No, there isn’t. If there was don’t you think your bank, or the bankrupt Greek Government would be doing this? It’s curious that EurexTrade don’t say how they could possibly make this sort of money. They explain their business using phrases like “short term, technical analysis based positions” and “longer term, global events driven long term profitable projections” and “in house developed trading algorithms” but that’s all rubbish, just a sequence of clever-sounding words. In fact all they are doing is taking the “investment” from you to pay something to the person who joined last week. Of course they’re keeping the majority of it themselves. That’s how a Ponzi scheme works. Ironically there’s also a slight pyramid scheme element to them as well. They say that their “affiliate program pays up to 10% on deposits of referred members.” So you get paid for conning other victims, presumably your friends, colleagues, neighbors and relatives? That’s not a good way to make yourself popular, is it? There is nothing good about EurexTrade. I urge you and everyone to avoid it before it collapses, just like every other Ponzi scheme inevitably does. On 1st August I called a cab company looking for a cab. They sent a guy but before I got into the cab I told him I only have P200, he told me he has change, so I got in the cab and started my journey but when we arrived at my place he realized that he doesn’t have enough change, he only had P200 notes. I then decided that since its late he will drop my change in the morning. In the morning I waited for him to come & drop my change but he didn’t show up. I called him & he told me that he came to my place but had deleted my number by mistake and promised to drop my change when he goes to work around 7pm. I waited patiently but he didn’t show up then I called him he got angry and said he gave me back my change. I called the company that he works for but they told me to report him as it is out of their hands, a few minutes later he called me insulting me for calling the company he works for. I think you should go back to the cab company and explain that their driver was working for them that day so it's their responsibility to refund you. They should then deal with the driver themselves to claim the money back from him. Feel free to mention that you've asked us for advice, they're welcome to call me and discuss it if they want. You should also complain to them about his rudeness. You have a right to make a complaint against anyone, so long as you do it politely and constructively. The driver has NO right to phone you and abuse you for complaining that he stole your money. Let me know if the cab company needs to be encouraged to do the decent thing? There’s been another spurt of romance and shipping scams recently so be warned. If you’ve got to know someone online, perhaps from a dating site or Facebook and they offer to ship you a package of valuable goodies, then be careful. What will happen is that you’ll get an email supposedly from the shipping company saying that you have to pay them before you can receive the package. Meanwhile your online “friend” will disappear, claiming to be on a business trip so can’t be contacted to make the payment. You end up paying money via Western Union to a West African scammer. Your relationship with your online friend or lover was all part of the scam, designed to get that payment from you. Be warned. The good news is that most stores do this. They might not give the total credit price “in characters of similar size” as the regulations require but it’s a start. At least you’ll have some idea of the total amount you’ll pay. You can see that it’ll often be twice, perhaps even three or four times as much as the cash price. You can then take a sensible decision (to go without and save up instead). The problem is that many of them commit other sins instead. The worst is keeping their contracts secret. The same mystery shoppers who checked up on the stores’ adherence on credit prices also asked the stores if they could take a copy of the contract away with them to read before they signed it. On several occasions they were told that this wasn’t possible. Some stores said it was against their policy, others said the contract would be explained to the customer WHEN they signed it, one was even told that they’ll get a copy of the contract in the post AFTER they’ve signed it. This is all grossly abusive. These stores refuse to let the customer see the terms and conditions of the sale they want to make. Frankly they’re crooks if they do this regularly. They deserve to be put out of business. They deserve to have no customers. The problem is that they DO have secrets to keep. I’ve seen some of these contracts and they are deeply and profoundly sneaky. One said that the customer agreed that the terms of the contract had been clearly explained to “him” and that “he” understood them completely. Remember that this is the contract he wasn’t allowed to see until after the goods had been delivered. Another contract included a clause that stated that customer had inspected the goods and that they were in perfect condition. This was the contract he or she was expected to sign in the store, days or even weeks before the goods were delivered. How could the customer have inspected the goods when they hadn’t even been shipped yet? That’s the sort of thing the stores don’t want you to know until it’s too late. Unfortunately it’s not just furniture stores that do this. We’ve heard recently from a couple of people who’ve had severe problems with a particular cellphone network provider. The problems emerge when they go roaming in another country. I think we all know that roaming is an expensive business. It’s always going to be more expensive to make a call from another country. You’re connecting to a foreign network, they want to make money from you as well as your home country network provider. But there are limits. One reader switched on her GPS-enabled smartphone in South Africa for approximately 5 minutes to get some directions and ended up paying over P300 for that brief connection. Another got home from a day-long business trip to Jo’burg to find that making calls and picking up his email had cost him P3,300. In a single day. When she queried this with her home network provider they told her that she’d incurred those costs by roaming with the wrong South African network. They had a deal with one provider, but she had connected to the wrong one. She didn’t do this deliberately, it was just the one that offered her a signal. When she asked how this enormous cost had been calculated they couldn’t tell her. Nor could they tell her the rates they charge when one of their customers connects to this alien network. I’ve checked, their web site mentions that it’s technically possible to connect to this other network but gives precisely NO information about the rates they’ll apply if you do so. None whatsoever. I’m not a lawyer but I have to wonder whether this is actually enforceable? How can they charge a rate for a service that they have NEVER disclosed to the customer and that is, in this particular case, nearly 20 times more expensive than the normal roaming rate? Don’t they have an obligation to tell the customer about this before charging it? Please, esteemed members of the legal community, tell me? Meanwhile I can only advise you to ask any company you deal with for details of charges you don’t know about. Before you go roaming ask you network provider what they’ll charge you when you’re abroad. Ask them what will happen if you connect to a network provider that isn’t their preferred one. Demand numbers from them. The same with any company that offers good on credit. Demand a copy of the contract to read at your leisure BEFORE you sign it. If you have any doubts about it, ask a friend, a colleague or us. It might save you a fortune. 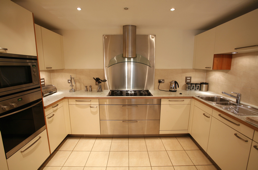 I ordered a fitted kitchen from a supplier in June and we only had a short time to complete the job. The order was placed when the company agreed to supply after 2 weeks. The colours available were very limited, I chose cream. The kitchen had to be fully paid for before full delivery. When the kitchen was delivered and partially fitted it became obvious that all the components of the kitchen were different shades of cream. The doors are slightly pink, the fixed panels a yellow shade and the edging is green. The company has inspected the kitchen and agrees that it is unsatisfactory. The different items were purchased from different suppliers on the basis of cost, and the problem is very common, apparently. The kitchen remains partially fitted. I spoke to the owner and she said she would evaluate different alternatives for sorting out the situation. My question is do we have to pay for any changes? I have agreed to consider accepting a different, contrasting colour for the doors and left her with my phone number so she could contact me with the alternatives and the cost of those alternatives. It is now more than a week later and I have received no information. Your advice on this would be appreciated. Frankly I don’t give a damn whether “the problem is very common” or not. You specifically ordered a fitted kitchen of a particular color and they delivered something different. I’m not a lawyer but this sounds to me to be a breach of contract, unless you knowingly signed something that allowed them to deliver items of colors of their choice, did you? I suspect not. I suggest that you write them a letter explaining that they have not honored their side of your agreement, that they have breached Section 13 (1) (a) of the Consumer Protection Regulations which forbids a supplier from delivering something that “does not match any … description given to the consumer”. Remind them that they offered you a cream-colored kitchen, you didn’t get one. It’s very simple. Give them a few days to come up with a solution otherwise you’ll take any legal action that you consider suitable. If they don’t cooperate then write them another letter saying that you’ll ask for a judgment from the Small Claims Court. I wonder how far do you function as a consumer watchdog? Do you just expose scammers or do you go to an extent of helping the consumer to recover by nailing the scammers and get them prosecuted? I say this because a day after I nearly lost my money to this scam, I came across your post and tried to warn others of this but unfortunately some had already put their monies in it. They usually come in Francistown to lure many people into the so-called investment. To my surprise, some of them are Batswana who claim that this isn’t a scam and that they have received their returns. How can these people be nailed? This email came into us in response to our report on a so-called “investment scheme” calling itself “Three Link Connection”. These people require “investors” to give them P11,800 and they apparently promise that this will double within 4 weeks. As you can imagine this is yet another scam. No genuine, respectable investment scheme can offer this sort of return. This is either a pyramid scheme, or more likely a Ponzi scheme where the joining fees paid by later “investors” are paid to earlier “investors”. In fact there is no investment scheme at all, money just flows from later to earlier victims. Some people at the beginning make a little money but sooner or later they run out of willing victims and it all falls apart. This particular scheme seems to be a reincarnation of an earlier South Africa scam called “Young Stars Investments”. The founder of that particular scam, Daisy Mogale, was prosecuted in South Africa but it seems like she’s at it again. She’s presumably no longer welcome to do business in SA so has moved north to scam us instead. Why don’t we run her and her dodgy scheme out of town? Have you ever wondered by scams are so obvious to spot? Don’t we all know by now that emails from total strangers offering us vast amounts of money are scams? Aren’t they blindingly obvious? The surprising news is that’s exactly why they work. Research by a researcher at Microsoft showed that the more ridiculous that opening email is, the fewer skeptical people will reply. Only the truly gullible reply to obvious scams. That opening email acts as a filter for the scammer. The people that reply have already proved themselves to be utterly gullible and naïve. The lesson is never to believe anything you read on your Inbox unless you have a VERY good reason to do so! I also blame the Ministry of Education, BTV, the newspapers and you, all of you who have children. You are all failing them by not giving them the most powerful skill they need to survive in the modern world. Skepticism and critical thinking are increasingly essential because the forces of superstition, criminality and exploitation are all forging ahead, finding new ways to scam us and take our hard-earned money away from us. Never before has there been a greater need for a link between science-based scepticism and consumer education. Some of the problem can be traced to sheer gullibility of course, perhaps naiveté is a more polite term. A less polite way of expressing it is my frequent observation that some people should not be allowed to leave home without their mother. They clearly need guidance on some fairly basic things. You don’t actually need a skeptical outlook to know that if you sign a contract you must abide by it, do you? You don’t need a PhD in Philosophy to know that furniture stores aren’t going to let you walk away from a credit purchase until they’ve got all the money you promised to pay them, do you? You know already that loan sharks, particularly the ones who refuse to register with NBFIRA, can’t be trusted, don’t you? Skepticism and science are inextricably linked. You can’t be a true scientist unless you embrace the skeptical approach wholeheartedly. This approach is simple. Don’t believe everything you’re told just because someone told you it and that there’s nothing that shouldn’t’ be questioned. Once you adopt that approach you see things in an entirely different light. What about an example? You may have seen that various New Age, mystical or “self- empowerment” gurus encourage their paying participants to try fire-walking. This, they claim, is a powerful example of “mind over matter”, of the human mind achieving what sounds like a miracle: walking barefoot over hot coals. It certainly sounds impressive. How can people do this without experiencing horrible burns? How can their feet touch coals at several hundred degrees without damage? It must be magic, surely? No, it’s not, it’s just physics. It’s about the conduction of heat. Consider this as an explanation. Imagine a chicken roasting in your oven. It’s been there for an hour and is cooking at 180C. Everything inside the oven is at exactly 180C. Imagine that you opened the oven door and put both your hands inside the oven. With your left hand you touch the skin of the chicken and with your right hand you touch the stainless steel roasting dish containing the chicken. You touch both for exactly three seconds. What would be the results? It would be simple. The fingers that touched the chicken skin would have felt warmth. The fingers that touched the steel dish would no longer have any skin on them and you’d probably be on your way to hospital. Anyone who’s ever spent time in a kitchen will have experienced this. Touching hot metal is agonising. Touching food that’s at the same temperature doesn’t hurt. That’s because metals like steel give up the heat they possess very quickly, organic substances like chicken skin and even coal give it up slowly. It’s why the coals in a fire can stay warm for hours, they give up their heat quite slowly. That’s why you can walk on hot coals. It’s not magic, it’s not mind over matter, it’s just physics. But this can go wrong. The so-called self-help guru Tony Robbins has been encouraging people in San Jose to do the fire-walking thing to help them “unleash the power within”, presumably after he’s unleashed their money. Unfortunately for 21 of Robbins’ victims, sorry I mean participants, something went horribly wrong. They all ended up with second and third-degree burns to their feet. I wonder who’ll be paying their medical bills? I suspect this is just more physics. While it’s safe to walk on hot coals, the organisers usually let them cool down a bit before allowing the gullible punters to “unleash” their powers. It didn’t work this time. But that’s not the only thing that didn’t work. If you adopt the skeptical approach you are forced to ask some awkward questions. What evidence, for instance, is there that motivational speakers like Tony Robbins actually offer any benefit to their clients? What good does all this up-beat, positive thinking actually achieve? I suspect that motivational speakers are a bit like prostitutes. Using their services might feel good at the time but afterwards you just feel dirty. You secretly know that you gave into a dirty temptation. You know you shouldn’t have but you also know you’ll probably do it again sometime soon. It’s not just innocuous motivational speakers you should question. Above all you need to question pseudoscientific health claims. Any Facebook user will have seen an online advert for a product called Baariz that claims it can “treat HIV/AIDS” and “cure” AIDS. Isn’t this obviously a lie, or am I just being too skeptical? Of course it’s a lie and a criminal one too but if you don’t have your skeptical brain operating you might fall for this nonsense as well. I DO blame teachers for this, and the people that employ them. I think we should expect that our children will be taught critical thinking at school, surely it’s a skill as essential as arithmetic and language? The risk we run if we don’t demand that this is taught is severe. Things will just stay the same. More and more people will fall victims to scams, will be financially ravished by loan sharks and will be seduced by sharp-suited motivational speakers, fake prophets and New Age nonsense-peddlers. The thing they have in common is their desire to take your money in return for a disease of one form or another. I have a problem with a cellphone store. I bought a Blackberry 8520 in February this year and suddenly it started to drain battery. This month alone I have taken it back four times and they even made me buy a new battery. They are unmoved to replace the unit. What should I do? I think you need to get a bit more aggressive with the store. We all know that batteries for cellphones and laptops have a limited life but they should certainly last longer than a few months. I haven’t heard their side of the story (which is why I’m not naming them) but it seems totally unreasonable to require you to buy a replacement battery for a phone that’s so new. I did a bit of research about this particular phone and you’re certainly not the only person in the world who’s had problems with the battery on this model. Many people have posted messages online with similar experiences. In fact if you do a Google search for “blackberry 8520 battery life” you find over 36,000 results. Of course this doesn’t mean your particular Blackberry battery is faulty but it does suggest the store should have done some research of their own before blaming you and making you cough up more cash. I suggest that you right to the store and explain that they’ve breached Section 13 (1) (a) of the Consumer Protection Regulations by selling you a phone that wasn’t of “merchantable quality”. Give them perhaps 7 days to remedy the situation, either by replacing the battery, fixing the problem or by giving you a refund. You should note though that they’re not necessarily going to give you a full refund. You did have use of the phone for a few months and they’re entitled to take that into account when calculating your refund. Let me know what they say and if they try and sort out your problem instead of just blaming you! I received an email from the Chairman of the Remuneration Committee of the National Lottery Commission in Birmingham in the UK saying that I had an inheritance fund of £15,000,000. It says that a relative of mine died having won the power ball and that he or she identified me as a beneficiary. What should I do? There is absolutely no doubt about it. This is a scam. The email you sent contains many clues. Firstly there’s the fact that they don’t name you. Their email opens with “Attn: Beneficiary”, not your name. If they knew your name why didn’t they use it to greet you? They don’t even name the deceased winner. They claim to be from the UK’s National Lottery so why can’t they construct a sentence in proper English? And this business of the winner dying and naming a beneficiary? Clearly they are relying on people not knowing how lotteries work. You just buy a ticket, you don’t even give your name unless you win. 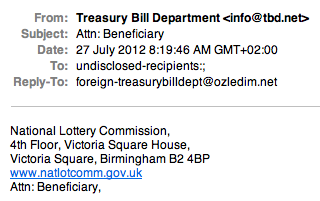 Oh and then there’s the free email address that a National Lottery apparently uses. If you reply to this email they’ll do their very best to string you along until, at the last minute, just before you think you’re about to receive your fortune, they’ll be a snag. It might be a legal fee, it could be tax or duty, it could be a banking fee. Whether it is, it’ll be fake, it’ll be an “advance fee”. That’s what this is all about, getting the fee from you. If you’re gullible enough to pay up, they’ll just make up more and more fees you’ll have to pay until you either wise up or run out of money. So in short, just delete the email. Several people have been in touch recently to ask about the validity of colleges and training establishments in South Africa. The good news is that there are authorities in SA who are meant to police training and education but I think they might be snoozing while on the job. One college I recently found has been awarding degrees despite them not being accredited or approved. Others seem to operate from people’s houses. Please get in touch if you need to check one. Remember it’s all entirely free. The excellent South African Reserve Bank get tough with TVI Express. Well done!